Back in 2011, I published a paid-for e-book titled Blogging Success: Tips for Creating Content, Getting Traffic and Monetizing Your Blog. Now I’m relaunching a revised version, with even more ways to make money from your blog. And I’m changing the price … to FREE! 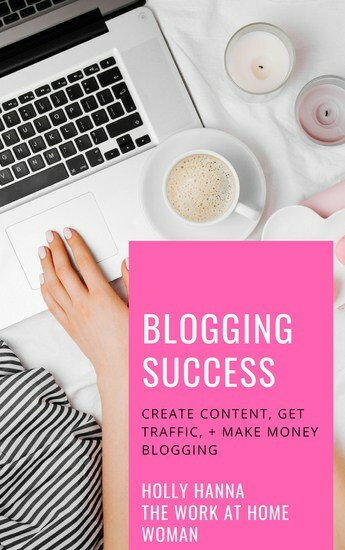 Blogging Success, or as I like to call it, Work-at-Home and Make Money Blogging is a 25-page e-book, jam-packed with tons of practical, actionable tips on how to create killer content, increase traffic to your blog, and most importantly, make money from it! Within this guide, I’ve decreased the learning curve by sharing bite-sized tips that are easy to learn and easy to implement. In this one guide, you’ll have access to all of my research, best and most effective tools and tips to becoming a successful monetized blogger. How to set up your blog in a few easy steps. PLUS, you’ll get inside secrets from four super, successful bloggers: Laura Wittmann from I’m an Organizing Junkie, Heather Hernandez from Freebies 4 Mom, Nicole Feliciano of Mom Trends, and Heather Reinhard of Theta Mom. Use the form below to get your free copy! Basically, everything you need to make real money with your blog. Did I mention it’s FREE? I used to sell this for $37! All you have to do is sign-up for a free subscription to my newsletter below (includes the free e-book, weekly job leads, tips, strategies, and promotions) and it will be delivered to your inbox, absolutely free. Enjoy the e-book and here’s to your blogging success! Is this book only for mom bloggers talkin funky about mommy duties or anyone looking to blog? I am also a mother but am looking to blog about fashion and food . Does anyone know if this will help me ? The article above was beyond helpful by the way, thanks a million! This is for all blogging niches, so yes, it will be helpful to you! Once you sign up for the newsletter — it will be sent to you. It takes about 24 hours for it to be sent. I also signed up with the promise of receiving the e-book: Work at Home and Make Money Blogging. Your subscription confirmation arrived, but no ebook. Would appreciate your advice. Hi Holly! I signed up for your newsletter a couple days ago in order to receive blogging ebook, but so far, nothing has shown up in my inbox – please advise, many thanks! Sorry about that – it may have ended up in your spam folder, or inadvertently got lost in cyber space. Just sent you a copy – enjoy! Hi Holly. What a find! Thank you for your expertise and for sharing so freely with others. I look forward to learning and sharing a lot with you. What a great resource!! Thank you! Hi I’m waiting for the free eBook also, thanks! Hi, I hope to get a copy of your ebook..
Hi, I am waiting for the free blogger e-book as well. Any luck? Just sent you a copy — enjoy! Hi. please send me a copy. Just sent you a copy, Laura, enjoy! Just sent you a copy, Stephanie, enjoy!